When he arrived on the scene as Stanza’s executive chef in May 2017, Jonathan LeBlanc might have had something to prove. He’d heard the restaurant’s lobster dish was in need of a reboot and set about creating his own Italian-inspired pasta platter bejeweled with buttery morsels of Maine lobster tail and Gulf Coast shrimp. 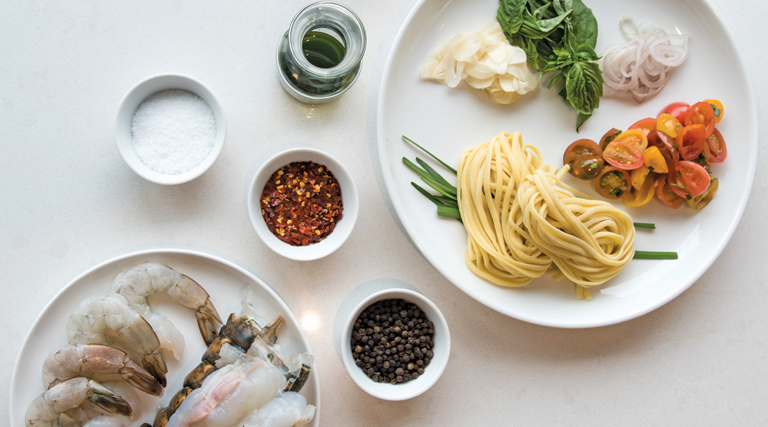 The linguine is made with just three ingredients: semolina flour, water and extra virgin olive oil. So many of Stanza’s offerings are built around the housemade pasta that LeBlanc says they go through about 50 pounds of semolina weekly. The element that truly makes the taste buds explode is the addition of marinated baby heirloom tomatoes. Biting into one, you’ll notice not only the fresh-herb seasoning but the surprising tang of white balsamic vinegar. After seasoning with salt, pepper and chili flakes, the mixture is plated with a drizzle of basil-chive herb oil and a fried basil leaf as garnish. 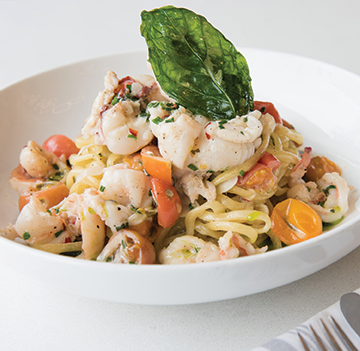 At $33, this pasta dish might be more of special-occasion meal, or one to share with someone you love. But what a dish it is—what you might call Chef LeBlanc’s mic drop.